Just four days after my Ho Chi Minh,Vietnam trip, I flew by myself to South Korea for a 4-days short vacation with my sister. The whole flight was filled wtih shilly-shallying feelings of what ifs and buts. But with full “I needed this trip” conviction, I just engrossed myself with music to dismiss all those uncertainties. This time around, I made sure I have a pen at hand. I also photocopied my documents especially my passport and plane ticket. But as always, especially at foreign land, things unfolded like a bombshell. I alighted from the plane as if I knew the whereabouts of the airport but to my surprise, it was far-off expectations. I was in no hurry to enter the terminal building, I told myself to take the time. But once inside, I found myself alone... Oh no, what to do and where to go now! I see no attendant or information desk around. All I saw was a closed glass door of what looked like train railings inside. I said, what the heck is a train doing here? Well, thankfully, a new batch of passengers arrived. This time around, I kept close, went with the flow and hurried as well as they rush to the main terminal. Whew! Luckily I passed the immigration officer softly and without inquiries, maybe the business visa was a factor. After the immigration line, I stayed by the outdoor waiting area. Ahh! come what may... Maybe sister will just fetch me here. Minutes gone by quickly and it was already an hour and no sign of my dear sister. By that time, I was already wobbly and failed to catch the words of the person beside me. I said hah! and he smiled in reply. He noticed my being lost and helpless. He was offering his phone so I can call my fetcher. Deep inside I said, how I wish I have her number... I gently said its okay she’s on her way... Grrrr... It was then that I realized that I was shivering not just of anxiety but of coldness as well. So I put my warmer and played the music again. Finally, after 1-1/2 hours of waiting, my sister arrived. It was 8:45pm already and I wanted to kill her. Grrr... She just smiled and I hopped in the car. I had no idea still that we were in an island... That was another lesson for me – to really do plenty of researches of the places I’m going. We crossed a bridge, a long long bridge... Wow! The architectural itself was beautiful and it was properly lit. I learnt that we were crossing the 21+ km Incheon Bridge. How I wished I had good pictures but thanks to this blogger Robert Koehler for sharing his shots online. She told me that we were bound for Anyang-si, Gyeonggi-do and out of way from Seoul. I just said, okay wherever I’m hungry... We will be staying at her boss’s house in Anyang but before that we had our late dinner first. Her boss chose a native basement-type restaurant. We had soup, Beondegi and Makgeolli... My God! I whispered, what will I eat? I just silently devoured the soup, some vegetables and rice and that was it for my meal. 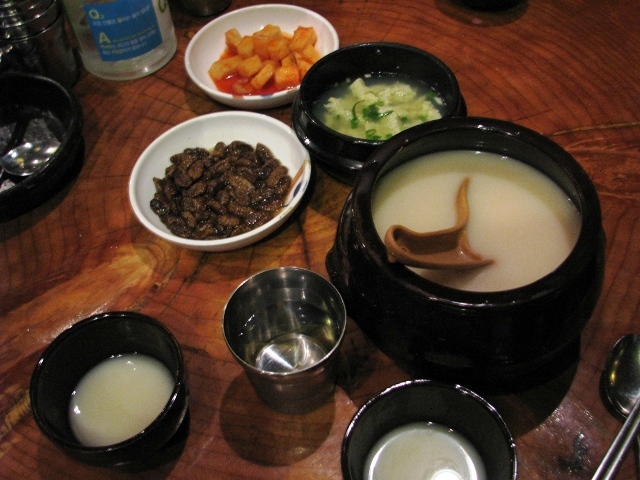 Ø Makgeolli also known as takju, is a traditional alcoholic beverage native to Korea. It is milky, off-white in color, and sweet. It is made by fermenting a mixture of boiled rice and water, and is about 6.5–7% alcohol by volume. It was originally quite popular among farmers, earning it the name nongju, which means "farmer liquor". Afterwards, we went up for some coffee. Yes, a coffee at night. According to sister, she describes the Korean habit as “work all day” then “party all night”. That’s why coffee shops are very much alive at night because they have a coffee first to shake off the dose before heading for home. I liked how the coffee shops were themed. For this night, it was a princess-themed boutique like a fairy tale story to put you asleep. wahhh you're so brave to travel abroad with no one with you. and didnt you dare to ask someone there? i couldve have killed my sister letting me wait for more than an hour in the airport. but looks like your singapore tour turned out to be fun.